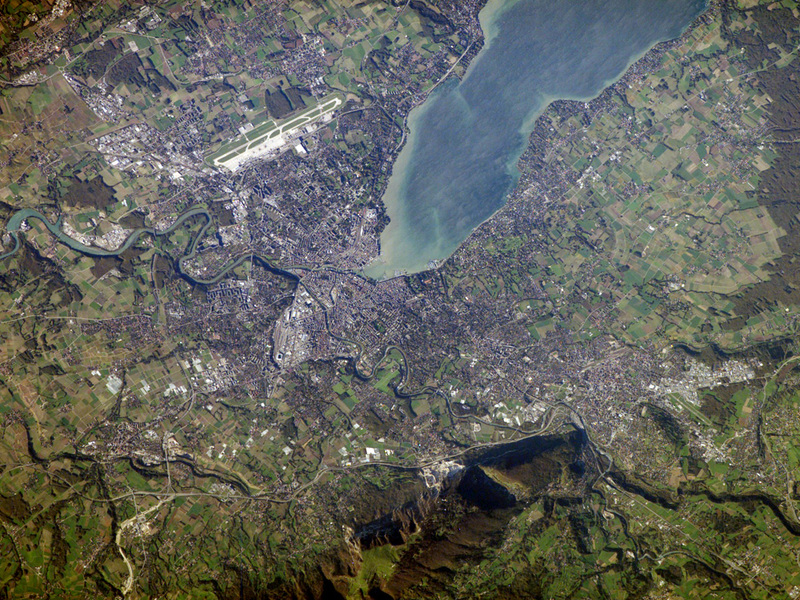 The city of Geneva embraces the southern end of Lake Geneva (also known as Lac Léman). 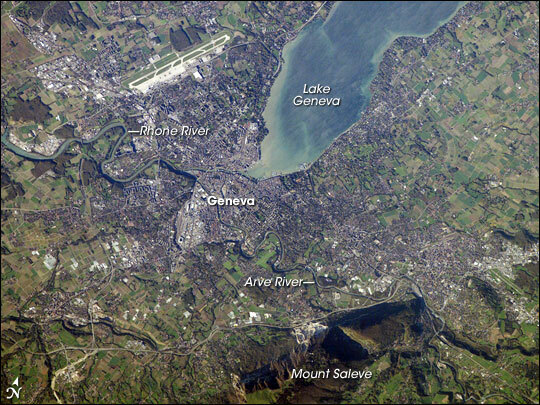 Geneva is tucked between two major mountain ranges, the Jura to the northwest (not shown) and the Alps to the southeast. Mount Saleve, near the bottom of the image, represents the northern foothills of the range. 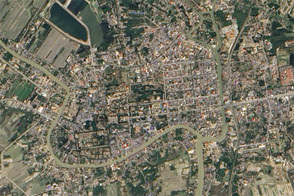 The city’s built-up area, roadways, and airport appear as white to gray surfaces in this astronaut photograph. Urbanized regions are interspersed with agricultural fields (bright green to light brown rectangular regions) and preserved forest stands (dark green) around the lake. In places, the forest stands cast shadows, giving the scene a three-dimensional feel. The near-shore waters of Lake Geneva are brown with sediment in this scene. The main contributor to Lake Geneva is the Rhone River, which flows in at the northern end and exits in the south. Near the southwestern outskirts of the city, the Rhone is joined by the Arve River, which runs into the city from the southeast. Both rivers have their sources in alpine glaciers. Geneva is primarily known for being a “world city” of cultural, economic, and political significance because it hosts numerous international organizations and corporations, including the European headquarters of the United Nations. Astronaut photograph ISS014-E-7084 was acquired November 2, 2006 with a Kodak 760C digital camera using a 400 mm lens, and is provided by the ISS Crew Earth Observations experiment and the Image Science & Analysis Group, Johnson Space Center. The image in this article has been cropped and enhanced to improve contrast. The International Space Station Program supports the laboratory to help astronauts take pictures of Earth that will be of the greatest value to scientists and the public, and to make those images freely available on the Internet. Additional images taken by astronauts and cosmonauts can be viewed at the NASA/JSC Gateway to Astronaut Photography of Earth.